"A scientist is a man with abnormal insight into the physical side of life, and in consequence, largely unconcerned with aesthetic and moral issues. To him, the questions, Is it possible? and Is it necessary?are the questions of importance, and Is it right? of no account whatever. A laboratory is thus moral-less, soulless place where life-saving drugs are produced dispassionately alongside poison gas or hydrogen bombs, and where the torture of defenceless animals is sanctified by the excuse that mankind is being benefited. Those who are morally sensitive enough to feel revolted at the notion of vivisection, are often confused when faced with the indesputable argument that human lives can be saved as the results of these experiments. Which are more valuable, it is asked, 'dogs or humans?' To which the answer, of course, is Dogs, if the humans are so inhuman as to torture dogs in order to save their own miserable skins." "The quesiton of vivisection, which may be defined as the subjection of animals to eperiments in the pursuit of scientific knowledge or commercial manufacture, is primarily a moral one, and it is upon this ground that I oppose it; for I refuse to believe that the pathway of true progress in human knowledge for the attainment of health can demand for its treading the infliction of pain and suffering upon beings weaker than ourselves, but sharing with us that One Life which animates all creatures." "Indeed, man only shows his superiority to the so-called brute creation in so far as he manifests the truly human attributes of compassion for the helpless, courage in the face of personal suffering, and heroism that even prefers death to dishonourable action." "Vivisectors are so busy attempting to re-create spontaneous human diseases in animals, that we still do not have a clue as to what causes most major diseases in man." "We must ensure that the public debate on this issue [cloning] is broadened to consider the interests of the animals whose lives are so intimately and helplessly involved in. 'We may be the only lawyers on earth whose clients are all innocent!'" "Your good article about causing serious questions when medical results on men studies are applied to women, opened my eyes: If men and women are so different, how in the world can scientists reach any valid conclusions from the myriad projects and experiments with animals??? It makes all the animal testing/experimentation pretty futile!" "Vivisector Bobby Gormus of Tulane U. captured sooty mangabeys monkeys from their homes in Africa to inject them with leper illness and watch leprosy eat away their faces!!!" "A leaflet from England said: 'According to World Weekly News Dr. Walther and Dr. Henry Kurig, delivered a paper to an unnamed International Medical Society in Paris in which they claimed to have kept the severed head of an accident victim alive in a private Leipzig hospital for 20 days. The patient was able to communicate by blinking his eyes in response to questions.'" "Our knowledge of the human heart derives from the section of cadavers and countless cases of serious accidents/injuries in which doctors must directly intervene, and from radiological observations. The heart of a dog is an unreliable and dangerous guide to the human heart. A dog's heart differs in fundamental respects such as having a highly irregular/intermittent pulsation. A heart surgeon cannot learn how to do a bypass or transplant correctly from having practiced on a dog. There are no substitutes for being properly apprenticed in the operating room, after extensive practice on cadavers, long hours of observing, assisting an experienced surgeon. The same unfortunate misleadings apply to brain surgery!" "The first patients to receive pacemakers died because they had been designed to suit the characteristics of dogs used in the experiments. It wasn't until after they were redesigned to accommodate humans' requirements from clinical observations on humans that they became beneficial." "'Alternatives': Obsolete word! It means one may or may not use animals. REPLACEMENT is the proper word meaning: NO! You may not use animals any more than you may use humans!!!" "Cruelty-Free toothpaste pioneer Tom's of Maine, has challenged Fortune 1000 companies that test on animals, with the pledge of a $5000 donation to an animal charity on behalf of the next company that stops animal testing!" "CANCERS? AIDS? OTHER MALADIES RISING??? If you value your ONLY health you have, do not let these enter your body! Read how to avoid most diseases through your own ingenuity, without poisonous medications or treatments. Hans Ruesch' SLAUGHTER OF THE INNOCENT tells how to avoid being experimented on you or a loved one while in a hospital! It's filled with proof that animal experimentation is a monumental fraud, totally unrelated to humans' illnesses!" "As a health care professional who directed a substance abuse rehabilitation center for 9 years, I'm dismayed and disgusted to see precious health care dollars squandered away on these trivial/irrelevant/repetitive/misleading animal experiments." "When evaluated on the basis of real usefulness to humanity, 'scientific research' is a fraud, whether intentional or not." "In the 'publish or perish' academic science world, it requires little originality/insight to take an already well-defined animal model, change a variable or the species and report 'new/ interesting' findings in a very short period! The many species available and nearly infinite possible manipulations offer researchers the opportunities to 'prove' almost any theory that serves their economic/professional/political needs; i.e., they have 'proven' in animals that cigarettes do or do not cause cancer depending on the funding source!" "By the year 2000 according to a December 16, 1988 New York Times article, death rates in hospitals will be excessive. We are now more prone to developing cancer than ever before, despite the billions of dollars and the millions of genetically engineered mice and other animals used to find 'miracle cures' which are always 'just around the corner'." "Torturing animals to prolong human life, has separated science from the most important thing that life has produced... the human conscience!" "To suggest that students can't study science without chopping up animals is as daft as claiming that students can't understand history without using a time machine. The Argentine government banned dissection in 1987 stating 'Biology is the science of life and it is not consistent to teach it at the expense of other beings. Experiments on animals are part of a dangerous process which tends to desensitize the mind to pain and suffering.'" "I'm in firm agreement that all the animal experiments in the world will not change the fundamental social problems of drug abuse and addiction." "There are hundreds of paths to scientific knowledge. The cruel ones can teach us only what we ought NOT to know!" "If we only look at it from the point of view of efficiency and economy, we are much better off doing anything we do in vitro than in animals because it's cheaper, it's quicker, it's more reliable, there's less variation - everything about it is better." "Tests on animals, no matter how well run, aren't going to give you the final answer because, quite simply, one doesn't know what effect our products have on people." "Procter & Gamble relies on archaic tests strictly for its own protection from liability lawsuits. P&G could stop animal testing today without hindering anyone's safety. Until it stops its animal cruelty, P&G will stand for PAIN & GREED! Please tell them so: (800) 543-7270." "As an ophthalmologist, I have no use for Draize test data because the rabbit's eye differs from the human eye... I know of no case in which an ophthalmologist used Draize data to assist in the care of a patient." Daniel Baden, ND Dip. Hom. "In the U.S. today the only cause of polio is the oral vaccine routinely administered to infants in society's drive... to rid the nation of this very same disease!" "There's Profit in Illness! Cancer Society does not help! We are not a society of prevention of illness or taking responsibility for our own health, let someone else do it for us. It's much easier to buy and pop a drug, for a hopeful quick fix even if that drug has side effects and is harmful and unnatural for our bodies. Add to this our stressful life styles and poor eating habits, is it any wonder then that the profiteers have us like puppets on a string for 'legal' drugs and junk food???" "Open up secret animal laboratories to TV and press cameras! Animal experimentation is voodoo/santeria - not science!!! Humans don't benefit from them - scientists' pockets do..."
"Science that fails to embrace all living beings is far more dangerous than any virus!" "During the last 70+ years, scientists experimenting on trillions of animals, came up with 900 ways of causing cancer in a mouse... BUT NO CURE TO HUMANS!" "Shun all medical treatments as they are deadly to humans and cruel to animals! They are evil, like witchcraft or voodoo and carry bad vibrations which cause psychic and physical damage. Everything in the universe has certain vibrations - cruelty carries negative and harmful vibrations. Cruelty always backfires on anyone causing/ patronizing it. Evil actions such as vivisection could only result in suffering and death to those doing or accepting it." "Giving custody of abused animals to the National Institutes of Health is like asking Jack the Ripper to protect a woman's dormitory!" "Vivisection is founded on the selfish principle that might is right, that the end justifies the means and that material benefit should take precedence to moral obligation. It appeals to the base instincts of fear and cowardice, and excuses any cruelty on the tyrant's plea of necessity. Before the bar of justice, vivisection stands condemned on three main counts: cruelty to animals, uselessness to man and obstruction on the path of real knowledge." "We are drowning and suffocating unanesthetized animals in the name of science. We are determining the amount of abuse that life will endure in unanesthetized animals in the name of science. We are producing frustration ulcers in experimental animals under shocking conditions in the name of science. We are observing animals for weeks, months or even years under infamous conditions in the name of science. With the aid of the halo supplied by the faith of the American people in medical science, the National Society for Medical Research converts sanctuaries of mercy into laboratories regardless of how the animals are to be used. What a travesty by humanity!" "This [animal experimentation] may well prove to be the blackest spot in the history of medical science!!!" "Lab Animals: Unseen they suffer, unheard they cry, in agony they linger, in loneliness they die!" "Kindness to animals inevitably leads to kindness to human beings. 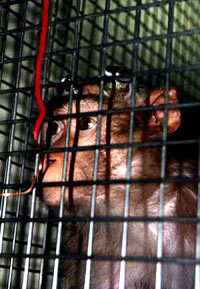 All cruelty inflicted on animals, inside or outside the experimental laboratory, brutalizes the perpetrator. Pain ends with the death of the animal but the degrading effect lives on." "Researchers claim that animals are like us, and we need to use them in order to understand and treat our diseases. But these same researchers claim that animals are unlike us, so that we need have no moral concern about our exploitation of them!" "It is difficult to entertain a warm feeling for a 'medical man' who straps dogs to a table, cuts their vocal cords, and spends an interesting day or week slowly vivisecting or dismembering them." "The laboratory animal lives in hell and dies in hell by the millions, every year, time without end!" "Testing Cosmetic and Household-Products: Frying mice in tin foil, pouring strong chemicals into the eyes of screaming rabbits, cramming lipstick into the anuses of guinea pigs, pouring strong acids down the throats and rubbing them on their bodies after stripping off the skin of many animals is the idea of the cosmetic/ household companies to protect themselves against lawsuits!!!" "I would rather submit to the worst of deaths, so far as pain goes, than have a single dog or cat tortured on the pretense of sparing me a twinge or two." "I believe I am not interested to know whether vivisection produces results that are profitable to the human race or doesn't. To know that the results are profitable to the race would not remove my hostility to it. The pain which it inflicts upon unconsenting animals is the basis of my enmity toward it, and it is to me sufficient justification of the enmity without looking further." "Animal Liberation Front (ALF) are not the terrorists - the terrorists are in the white coats in the labs. ALFs are peaceful rescuers of animals who do not recognize the animal experimenters' 'animal property rights'!" "Federal Freedom of Information Act makes it possible for anyone to obtain vivisectors' grants documents & lab inspection reports, by accessing 'CRISP' and 'MEDLINE' computer systems. Medical Journals and animal periodics also describe vivisection procedures, and who is doing what, where and why." "'GET ME OUT OF HERE!' Desperately begged Washoe to a visitor! He was a caged ape kept by Roger and Deborah Fouts to teach him OUR language! The nonhuman holocaust is being challenged on many fronts. Chimpanzees can abstract. Pulitzer Prize winner Dr. Carl Sagan asks: 'How smart does a chimpanzee have to be before killing him constitutes murder? Like other animals, they are capable of strong emotions. They have certainly committed no crime.'" "Booee was another chimpanzee in captivity by Roger and Deborah Fouts to teach him OUR language. AND FOR WHAT??? TO END UP... IN A LABORATORY!!! 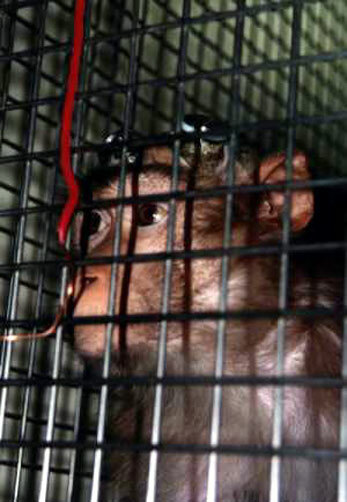 In their own article 'My Brother's Keeper-A Reflection on Booee' in Satya Magazine 12/96, it was stated that after the language experiment, Booee spent 17 years at the Laboratory for Experimental Medicine and Surgery in Primates (LEMSIP), at the New York University School of Medicine in upstate New York!!! And for this, Booee had to suffer the inevitable torments of captivity including isolation from his own species/habitat/other! We now have created a NON-HUMAN EXPERIMENTAL SUBJECT who knows OUR language yet was used in a vivisection lab for 17 years - his knowledge of language didn't save him from burning in hell in his lifetime! His researchers having finished (tired of?) damaging his entire life, go on with theirs... (AND others'), unconcerned and happy giving lectures/writing books about their 'success'..."
"There are two more sinister ends in the bloody business of animal experimentation: (1) acquire knowledge for knowledge sake by torturing/murdering animals (2) give to animals knowledge for knowledge sake by torturing...then murdering them!!! 'Scientists': you have attained the ultimate mode of life... a FRANKENSTEIN in the 21st Century!!! You are (poor entities!) hopelessly brain-defectives!!!" "Vivisection: No Lie Can Live Forever!" "Vivisection is an outrage against any civilized concept of decency." "I believe I'm not interested to know whether vivisection produces results that are profitable to the human race or doesn't. To know that they are profitable to the race would not remove my hostility to it. The pain which it inflicts upon unconsenting animals is the basis of my enmity toward it and it is to me sufficient justification of the enmity without looking further." "A day will come when the world will look upon today's vivisection in the name of science the way we look today upon witch hunts in the name of religion." "What I think about vivisection is that if people admit they have the right to take and endanger the life of living beings for the benefit of many, there will be no limit for their cruelty." "This is one of many ways vivisectors try to get their promised cures to humans' illnesses: 'Urination: find out why an adult male dog lifts his leg to urinate while a female squats.'" "'BABY OR DOG, ANIMAL RESEARCH KILLS BOTH: BILLIONS OF DOLLARS, MILLIONS OF ANIMALS, WHERE ARE THE CURES?' said large banners wielded by David Brainerd at a demonstration at the John Hopkins Spring Fair." "Most research today is just repetitious protocol, done to write papers, to complete educational requirements, and to obtain federal grant money. 90% of animal experiments are done carelessly, callously, in filthy surroundings, upon starved and mistreated animals (these things the public will never be allowed to see), for the sake of research is an end in itself, and done when the outcome is already well known." "Many young students compete for prizes in extremely violent so-called 'science fairs', performing terrifying/inhuman experiments on helpless creatures! A boy shows a dying monkey, with pus-exuding holes in his head to demonstrate his skill at implanting brain electrodes. A girl plucked the eyes of a sparrow out of curiosity to see if it feels pain. In each of us there's a bit of violence, some more than others, but none more profound than those who vent their frustrations on defenseless animals. They are at the pit of all evil!" "Bad enough that adults butcher animals for any reason/any way/anywhere... but forcing children to do it reminds one of the Nazi SS youths who early in their lives were taught the 'moral duty' to torture/murder beings that were 'different'..."
"Even marine mammals don't escape the absurd/inexact 'science' of animal experimentation! Bonethead and nurse sharks captive in the Mote Marine Lab are given high doses of the potent cancer-causing agent aflatoxin... YET no cure for cancer has been produced in over 75 years by any animal lab!" "The March of Dimes now knows something about the effects of alcohol on possums, and of benzodiazepines on the offspring of pregnant rats... But people who donate to them expect to see their money to fight human birth defects, which have remained high. Even the authors of the benzodiazepines studies admitted that the animal data is conflicting! In contrast, epidemiologic studies (based on large human populations) provided consistently crucial information. They identified the thalidomide disaster/ fetal alcohol syndrome/fetal rubella syndrome, to name a few. Instead of funding dead-end animal experiments, they should provide health care to pregnant women and educate them on the dangers of teenage pregnancy/alcohol/ cigarettes/drugs. Re-route your donations to the increasingly long list of charities that study the human organisms instead of animals." "Humanitarians are not anti-science; they are anti-cruelty! Animal experiments are insane and supported by your taxes. Countless animals suffer/die in biological exercises which can be learned with tissue culture/mathematics/other exact sciences. Animal researchers display a pathological disregard for the suffering of their victims and a professional bigotry which is not consistent with true scientific objectivity." "Vivisection: cutting live animals/burning/roasting/freezing/ smothering/electro-shocking/strangulating/blinding/addicting/ starving/sleep deprivation/maternal deprivation/injecting illnesses/ feeding burning-hot-poisonous substances... AND lots more dementia, to healthy animals! The unending physical/ psychological torment makes them eat their own body parts in desperation! Slow (though agonizing) death is their only peace!) School children encouraged to do this in their basements for their 'science fairs' (read, show-of-torture fairs)! The $10 billion vivisection industry refuses to adopt the many/increasing replacements already in existence/more accurate/cheaper/more beneficial to humans!!!" "Man, in his monumental egoism and selfishness, has completely forgotten the fact that he himself is an animal and that the same life/blood which run through his veins are also a part of those very creatures which he tortures with his experiments." "The American public has been trained to accept anything that sails under the flag of science." "A recent 7-year study by the well respected University of Uppsala in Sweden of 84 laboratories around the world showed that safety-testing HIV drugs on other species is less reliable than tests on human cells. The study showed human cell methods are about 50% more accurate in predicting drug toxicity than whole, live animals. REPLACEMENTS are 1/10th to 1/4th of the cost of animal tests, per toxicologist Dr. Frank Barile, of City University, New York City. Besides being cheaper/more accurate they are invariably faster than animal tests; i.e. : human cell tissue/computer analysis models/ Corrositex, approved by government agencies in Canada and US, AND authorized by the European Center for the Validation of Alternative Methods." Those who experiment upon animals by surgery/drugs and inoculation of diseases, should never quiet their consciences with the conviction that their cruel action may have a worthy purpose. "Colgate's 'new' (DEET) insecticide, sickens and kills animals, yet it is still sold to consumers!!! SELDANE, a widely prescribed allergy drug, which passed countless animal tests with flying colors, is now under scrutiny because of serious side effects in human beings." "Dr. Ray Greek: 'When humans undergo organ or bone marrow transplants from non-humans, they are inviting dangerous, even deadly viruses to enter their bodies.' Over 150 infections have been identified that can be transmitted from animals to humans via organ transplants." "I abhor vivisection with my whole soul!" "Monkey virus in SV40 polio vaccine directly linked to cancer. Epidemiologists estimated between 10 and 30 million people in the US received live SV40 vaccines and an unknown number elsewhere..."
"As a man of the cloth, I'm not going to lie to you, or even stretch the truth, about vivisection: It's savagely cruel/it costs billions per year of tax dollars/it's barbarous/obsolete/terribly sadistic/ nothing of value is ever learned to help humans/it's big - very profitable - business for vivisectors. Most 'findings' cannot even be translated from one animal species to another - and certainly NOT to man!" "Primum non nocere (First, do no harm)." "In this day and age, with all the non-invasive scanning techniques available to the research community, it is inconceivable that an individual would be so callous as to take infant monkeys away from their mothers, damage their eyes, drill holes in their skulls, insert electrodes in their brains. How a person like that can sleep at night is beyond comprehension!" "(In comparing humans and nonhumans for lab use): 'The anatomical, physiological, immunological, genetic, histological and even psychological differences are too great to overcome.'" "We have cured mice of cancer for decades - and it simply didn't work in humans." "I use NO cosmetics or household cleaning products tested on animals. I boycott P&G and Gillette, among others, because they test their products on animals. I'm repulsed by animal testing for new medicines and medical procedures... I believe animal testing is UNNECESSARY and counterproductive. Researchers get large grants to do experiments, and this makes animal testing a big bu$ine$$ - silly experiments done just to keep the money coming in. Animals are NOT biologically the same as humans, so to experiment on them for human drugs is not viable. Animals are not given painkillers when they are being experimented on (because it may skew the results), and they are kept in tiny, filthy cages ALL their lives! It's unspeakably cruel! Do ends justify the means??? I've seen what's done to those lab animals and it's shocking! I also know that having Parkinson's Disease or being a quadriplegic is a kind of torture too, and I want those people to be helped. I don't give any money to charities involved in animal research, no matter how noble the cause. Overall, if we abandoned animal research we would figure out more humane ways to do those same experiments." "We have not lost faith - we have transferred it from God to the medical profession." "Is suffering endured by a nonhuman as morally significant as that endured by a human? Initially, it might seem obvious that nonhumans are morally inferior to humans, that their lives and suffering count for less. But it once seemed obvious to many that Blacks were morally inferior to Whites, women to men, and Jews to gentiles. A bit of reflection makes it seem silly that skin color, gender, religious background, or heritage could provide a basis for a morally relevant distinction. The same can be said for species. How could the species of a being (i.e., what DNA it has) possibly matter to how much its suffering counts? The fact that human suffering is bad has nothing to do with the fact that it's endured by humans; suffering is simply bad." "The recorded tortures of human beings (by their own species!) are seldom of such long duration as those inflicted upon lab animals. Most of lab animals suffer from repeated experiments for months even for years!" "At Animal Research Institute we are trying to breed animals without legs and chickens without feathers." "It is difficult to picture the great Creator conceiving of a program of one creature (which He has made) using another living creature for purposes of experimentation. There must be other less cruel ways of obtaining knowledge." "Science is nothing more than an imaginary knowledge of the absolute truth." "Horrors that only a few years ago belonged in the realm of dystopian science fiction have become common place in today's world - generically engineered Frankenstein foods are forced down our throats by governments and corporations; animals soaked in a bath of poisonous growth hormones are slaughtered in the name of a quick buck and increased profit; vast warehouses of 'bio-machines' (better known to you and I as pigs) lie in darkness, ready to be harvested for their organs for human transplants; the country side is dotted with concrete bunkers where bloodied vivisectors tirelessly work their way through the guts and viscera of endless animal victims." "When I was still in high school, I started using cosmetic products that were not tested on animals. This was prompted by a documentary that shocked me and which made me aware of how these experiments were being performed on animals. As a consumer of that type of products, I felt responsible and decided to change my habits – which was quite simple – I simply started buying products that were on the White List. Now I have the chance to invite people, together with Animal Friends and Damir Hoyka, not to be 'blind consumers' and to remind them that there is an alternative to all that insensitivity." "I am convinced the time has now come for politicians to take an uncompromised stand to achieve a ban on all non-human primate testing." "This whole business of using animals in medical research and pharmaceutical testing is a whole multi-euro billion industry, because we do have all the people who are learning how to use animals. You have the people who are breeding special strains of animal, like mice and rats, for certain kinds of experiments. You have the people who are selling the feed, you have the people who are making the cages and so it is a whole big industry out there using animals, and that is why some people I think are really wanting to maintain the status quo." "There are two categories of doctors and scientists supporting vivisection. Those that know nothing about it and those who profit from it." "These are revolting and unnecessary experiments. Sadly, we are too familiar with the effects of terrorism. It is perfectly possible to find out things we don't know without blowing up pigs to find out." "When Animal Friends contacted me and showed me some of those terrible photos, I did not question at all if I should join this campaign. I am very pleased that this opportunity may draw attention to the senseless and unnecessary killing of animals [for vivisection]." "I am very glad to participate in this project, which has a noble goal. This is just a small step to draw the people's attention to what happens in laboratories, where because of tests animals suffer and die. All this is unnecessary, especially nowadays when testing can be done in many other ways. I invite everyone to pay attention to the white list and only buy products that are not tested on animals, and this way be an example to others and show that animals did not deserve that. Each of us can make a small step, thus together we do a great thing!" "Scientists have moved from investigating nature as a vocation, to being caught in a career path where it makes sense to 'fudge the data.'" "I adore animals and I would never hurt them. I love them more than humans. 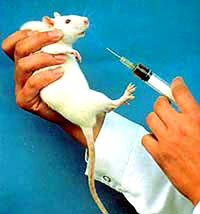 I will support Animal Friends by offering myself to be tested for botox instead it being tested on mice." "I hate the idea that people wanting to be beautiful and smooth should use such an ugly and cruel product. Don't touch it: support instead the brilliant substitute for animal testing, and keep your conscience as unmarked as your brow." "We can stop this cruel and unnecessary act by bringing light to what has clearly been done in darkness for too long. I think it is a sick way to test something that is for cosmetic use. They are not trying to cure cancer here; this is about smoothing the wrinkles on the faces of women and men. How many innocent animals have to suffer? Let's put a stop to this cruel, inhumane, and above all unnecessary act." "Please, don't allow animals, who feel pain and fear just like we do, to suffer simply for our own vanity." "Last year with Animal Friends and a rabbit I appealed to the people through billboards, fliers and the video not to use products tested on animals. I am glad that due to this campaign so many people became aware of this issue and now buy products for which animals did not have to be tortured and killed. I am happy to join the signing of this petition and I invite everybody to do the same. Let us with our signatures together stop the suffering of these innocent creatures – to be above cruelty." "I've always been fascinated by the incredible intelligence and rich, complex social lives of chimpanzees. It would be shameful to see them go extinct in the wild as we continue to exploit them here in the U.S. in invasive experiments, entertainment and as pets." "Beagles, indisputably, are highly intelligent sentient creatures, friends of Man for centuries. It is completely morally unjustifiable for these animals to be made to suffer in the name of science." "Like me, most people will be shocked to learn that testing cosmetics on animals is often still a legal requirement in China. By law, rabbits must have cosmetic chemicals dripped in their eyes or spread over their sensitive skin, causing sores and bleeding. It makes me really angry that this is still going on, and it makes me particularly angry that some previously cruelty-free companies are abandoning their principles and returning to animal testing in order to profit from the Chinese market." "Cruelty-free beauty is here in the EU (European Union) at last! I have been calling for this day with Cruelty Free International (BUAV) since 1991. Well done Cruelty Free International (BUAV) for your tireless work in the EU to end the terrible practice of testing cosmetics on animals." "It is unacceptable that animals continue to suffer around the world, including the United States of America, for the sake of beauty. I appeal to the USA to follow the European Union’s lead and end animal testing for cosmetics."